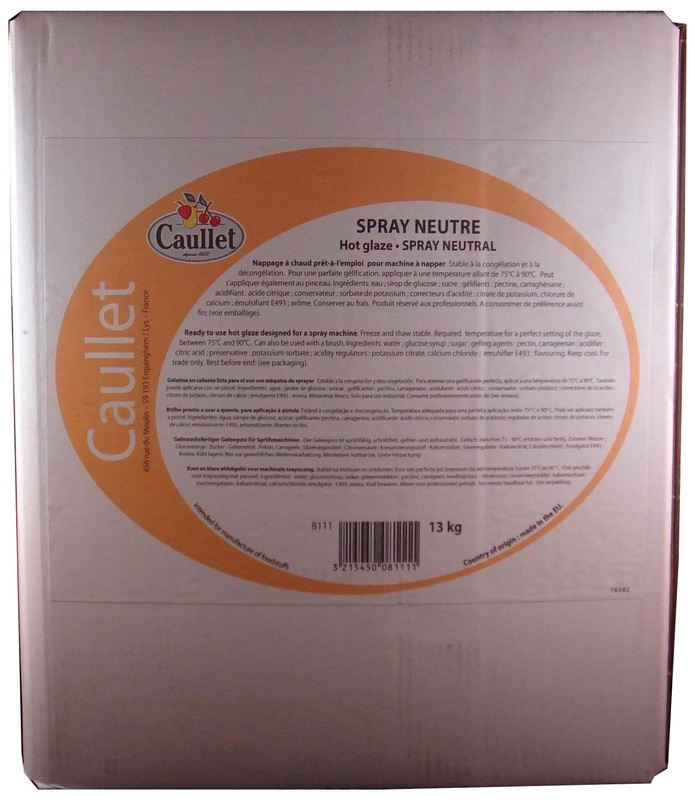 Ready-to-use hot glaze in 13kg bag-in-box packaging (BIB) designed for a spray machine. Freeze/thaw stable. Water; Glucose syrup; Sugar; Gelling agents: pectin, carrageenan; Acidifier: citric acid E330; Preservative: potassium sorbate; Acidity regulators: potassium citrate, calcium chloride; Flavoring; Emulsifier. Bakery: it protects and gives a shiny appearance on fruits. It is an economical product, applicable in thin layers on your desserts. Designed for direct application with spray machines on pies, danish or puff pastry. Required temperature for a perfect setting of the glaze: between 75°C (167°F) and 90°C (194°F). Size (in): L 9.1" x W 7.9" x H 11.0"